I am NOT trying to pitch a diet of pine cones and twigs but I am thinking of starting my own cereal company. Eating right is important to good health, we all know this. If you eat doughnuts and Twizzlers you will eventually look like a doughnut and have the brain capacity of a Twizzler. BUT if you eat well you will feel well. You might even look better and live longer. I love cereal. It could eat it three times a day and that is just at breakfast. But every box of cereal I really like comes with things I don’t like. Some come with too much fat and no raisins. Others come with raisins and no other flavor. Some are melt as soon as the milk hits the bowl. Others could outlast a nuclear disaster. My cereal has all the best things combined into one bowl. 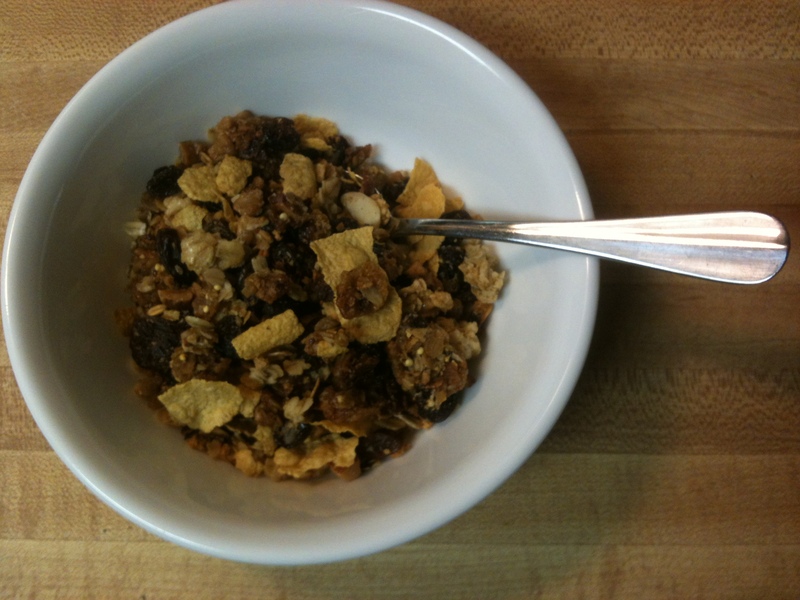 I use raisins (of course), but I also toast whole oats and almonds. The mix is a combination of Wheatberries, Millet and Barley. I use pure honey and maple syrup. I toast and toss. I mix and stir. Throw in some corn flakes and a special ingredient and spice and it is ready for even the most discerning of palates. Food is an important part of my quest to becoming a better person. This cereal may just be the best tasting part of the journey! I love it, Cathy! Thanks for sharing your passion. If you want, I can add my own picture of a little dance from my past (Everything Old is New Again)! Would love to see that and loved the jazz band post!